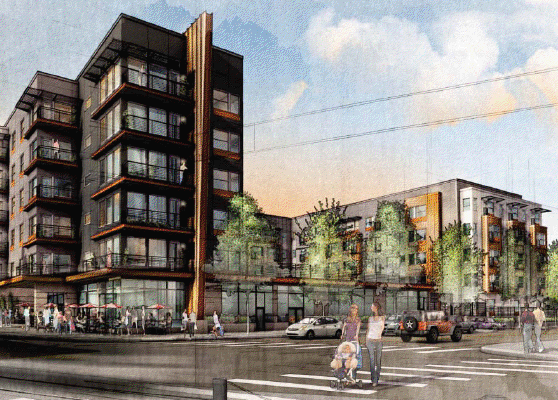 With Portland’s tight rental housing market continuing to push new construction projects, Sierra Construction of Washington state has announced it will break ground on the 155-unit Prescott Apartments on North Interstate Avenue and Prescott Street on Wednesday, April 4. The $29 million project will have 105,000 square feet of studio, one-bedroom and two-bedroom apartments and 9,500 square feet of ground floor retail space. The U-shaped building will be five stories with one six-story wing along Interstate. It will sit directly across from the Prescott Street MAX light-rail stop. The building will have 111 parking stalls. Developer Prescott Apartments LLC expects units to rent from $900 to $1,800 a month, depending on the size. The building joins a handful of mid-rise buildings in the corridor including, the subsidized Killingsworth Station project completed last year. Suzy Tangen of Sierra Construction believes the area is well positioned for continued growth. Tangen stated the company’s Portland office would build the project. The company is also building a New Seasons Market about a mile to the east on North Williams Avenue. Sierra originally bought the block bordered by Interstate, Prescott, Skidmore Street and Maryland Avenue in 2008, shortly before the collapse of the real estate market. The land was subsequently sold to Prescott Apartments LLC. A group of single-family homes that occupied the block were used as practice houses for Portland Fire and Rescue in 2009. The building should be complete in early 2014.